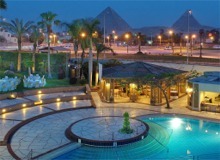 Come and discover the capital city of Egypt, Cairo for a holiday full of culture and experience. Cairo is the second biggest city in the Muslim world and is packed full to the brim of things to do and see. Cairo is not just a disabled holiday destination, it’s also a city where people live and work which means that there’s a perfect blend between the old and new. A holiday in Cairo is like being stood in an outdoor museum, everywhere you go and look there is evidence of this area complex and intriguing history. A historic and cultural accessible city break waits for you here. Beautifully set in its own landscaped gardens with an unrivaled and time-honoured location, less than 1 km from the Sphinx and the Giza Pyramids, one of the seven ancient wonders of the World and only twenty minutes from Cairo's city centre. Beautifully set in its Mercure Cairo Le Sphinx is located at the foot of the Giza Pyramids and the Sphinx, 35 kilometres from Cairo Int'l Airport and 15 kilometers from the town centre. Nearby the hotel are a wide variety of tourist attractions, monuments, museums and entertainment attractions.